Breathing room.. I think the highest my bank account has ever been was just over the amount I needed to buy a Corvette. Being primarily an explorer, I've made a decent bit of coin being out in the black. But the Void Opal, Low Temp Diamond boom was too tempting to pass up, even with my aversion to mining. So, I took what is arguably the most versatile ship every made--the Python-- and configured it for mining. After a brief absence from my fleet, I had re-acquired The Ceti Zorro, new and improved and she was itching for a mission. Once I loaded her up with the necessary mining modules, Guardian FSD booster and completed the engineering (combination of pinned blueprints and local Colonia region engineering), I headed out away from Colonia proper to some systems I had deep-scanned while on a recent exploratory jaunt. Systems where I had found bountiful Void Opal hotspots. In two days' time I rebounded my bank account to 350mil credits--a new record for me. So, now I'm going through my Colonia fleet, ship by ship, to upgrade what can be upgraded, engineer what can be engineered. And, darn it, I keep forgetting that I now have access to the Guardian FSD Booster as I'm doing this. I have to make sure, for the ships that have the room and the need, that plan for that space and actually buy the damned thing! I just finished refitting my first real ship, The Ceti Fox (a Diamondback Explorer), and it's been a genuine pleasure. Just over two years ago I migrated to Colonia in this ship, with no engineering, hardly any knowledge and a jump range of just under 25ly. I had never been to Colonia before. I didn't know about the neutron superhighway. I quite literally pointed her in the direction of Colonia and started my journey. Three months later I arrived at Jaques Station. And even though she really is showing her miles in the cockpit, she feels like a new ship again. Even loaded up the way she is now, I've got 49ly jump range on her, and she's more nimble than ever. She'll never be a Vulture or Chieftain, but, hey, she'll get the job done. 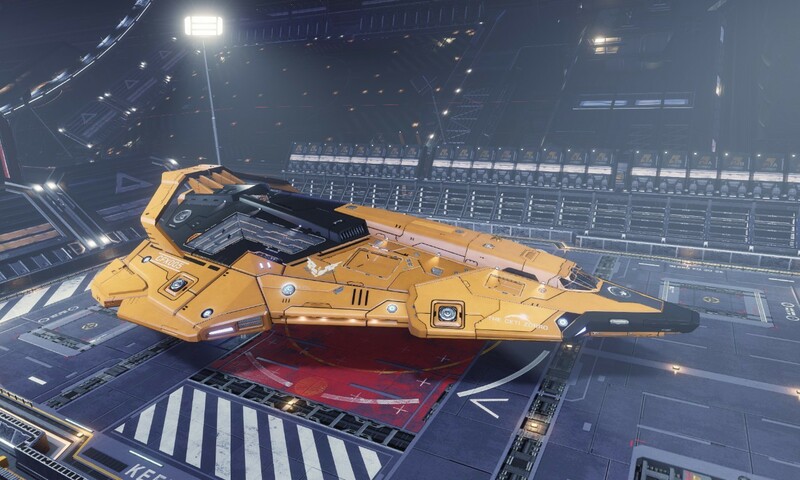 Right afterward I tweaked my exploring ship--an Anaconda--The Ceti Azeria, which didn't need a lot of work because it was already upgraded and engineered from a trip the Core Systems early last year. I just had to hank the passenger modules and reinstall the modules I typically gird myself with for long-range exploration. Namely, this would be repair and refuel limpet controllers, AFMS, an SRV and a fighter, on top of the normal basic modules. I run with buffed shields since I can do so with minimal impact to mass when I engineer them. I dispense with the offensive weaponry and Shield Cell Bank since I plan to evade if I get interdicted--keeps the mass down given she is in no way configured for a fight. Why a fighter, you ask? For the fun of it, absolutely. Even with fully enhanced thrusters, canyon carving a distant world is not optimal in an Anaconda. It is, however, fun in a fighter. I'm about half-way through refitting my Krait Phantom. I ran out of some of the engineering materials, so I'm on pause while I go grind for those. Ya know, I love making my home at Colonia Dream because it has the largest shipyard in the region, has one of the three material traders (Encoded Materials) in the region (Tolagarf's Junkyard in Kojeara has the Raw, Foster Terminal in Coeus has the Manufactured), and is really close to the parent star. But there are two down sides. First, no Cartographic Services there--I have to hop over to Bonestell Outpost a couple of planets over to sell my data. Second, there are only two factions in the system, and the number and variety of missions that pay off in high credit amounts or rare materials are very few and far between. I have reputation in some other systems, including Colonia, so I'm sure I can find the right missions. But it is a grind.